One thing my Dad (And Chiropractor) always said when we were younger (and to this day) was that if you want to achieve your goals, you need to write them down, read them, re-read them, and take the necessary steps to make them happen. Last New Year’s Day, we all sat around the dinner table enjoying the first meal together of 2014 when we began sharing our resolutions for the upcoming year. It was here we vowed to work out more, eat less, and my brother and I decided we would complete a 10 and 5K run respectively. For those who run all the time, I get it, 5K doesn’t seem like a major feat. For someone who hadn’t run in over a year (pre-wedding cardio) it was a bigger deal. I always tell my Chiropractic patients that exercise is a major component of a healthy lifestyle (along with balanced nutrition, proper sleep, positive mental attitude, and of course a functioning nervous system courtesy of regular spinal adjustments!) and I try to practice what I preach. So the run would help motivate a training regime! It didn’t regulate any type of regime. Other than weekly sports, cardio and some weightlifting, the running was not part of the exercise I hoped it would be. September approached and I was sure glad I picked a ‘fun run’ that welcomed all sorts of try-athletes. Run or Dye Hamilton meant every kilometre marked motivation from a team of volunteers and an explosion of coloured powder paint that would be thrown upon you! What could be more fun than attempting to complete your goal while becoming a tie-dyed version of yourself? The weather turned on us and stayed grey, cloudy, and of course rainy. Perfect conditions for an outdoor event, right? Well we had a blast. A colour blast. My sister-in-law and I bedazzled ourselves in superhero costumes (complete with rain capes) and ventured from couch to 5K! 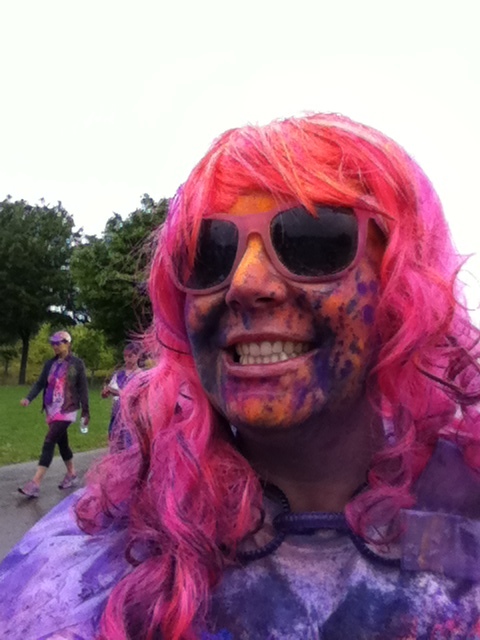 As we crossed the finish line, we were among many cheering and dancing souls painted every colour of the rainbow. We were excited to have accomplished our goal, and did it in less than 45 minutes which while not record worthy, seemed awesome to us! As we walked back to the car we applauded our goal, our effort, our positivity through rain, and our accomplishment. I encourage you to pick a goal that may seem foreign to you, set your mind to it, and go! I also encourage you to make Chiropractic a part of your lifestyle. Getting adjusted helps with almost any health goal you can imagine! Change the quality of your sleep? Get adjusted. I can tell you come Monday; it was the first thing I did post-race! If you are interested in booking an appointment with Dr. Tiffany Huggins, or want to have her as a guest speaker at your place of business, call 905-845-2291 to book.